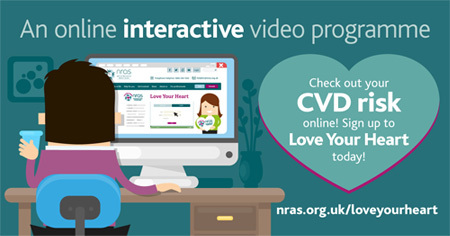 This Valentine’s Day, NRAS is delighted to announce the launch of their online, interactive video educational programme ‘Love your Heart’ that will help those with the debilitating condition Rheumatoid Arthritis (RA) understand why they are at increased risk of cardiovascular disease (CVD) and the impact RA can have on a critically important organ - the heart. Love Your Heart is a new, interactive online video programme that has been developed in partnership with Consultant Rheumatologist, Dr. Holly John. This follows extremely promising results that it achieved in a face-to-face group setting. Working with leading interactive video producer Streaming Well, NRAS is making this groundbreaking programme widely available to everyone with this serious autoimmune condition so that they have the opportunity to find out why they are at increased risk of CVD and provide tools to help them lower their own individual CVD risk. I believe that this initiative is the first of its kind within healthcare in that it incorporates a full training programme into a single interactive video. Originally, the programme was to be launched as a website, but we realised that increasing the amount of video and making it interactive would bolster the learning outcomes for patients. Before I did this programme, I thought that I was doing pretty well in terms of diet and exercise but it showed me that there was a lot I wasn’t aware of, that my knowledge of lifestyle factors wasn’t adequate and I needed to do more to help myself. I found it a valuable and life-changing experience to do this.